Poor Nicholas Brilleaux. He was sued for being funny.Brilleax, who is currently a senior majoring in history at Southeastern University, penned a satirical article for Hammond Action News that the local wildlife reserve took issue with. Action News 17: [Global Wildlife’s] petition seeks an injunction to remove an online piece entitled “Giraffe Claims Third Victim at Global Wildlife.” The article, which spoofs SeaWorld killer whale trainer attack news reports, describes a fictional giraffe guide attack at the local wildlife refuge. It seems the article has been taken down from HAN, but we found it here. I’m not a lawyer, but I remember learning that parody and satire are protected forms of speech back in Media Law class during my undergraduate career, so I would guess that Brilleaux’s luck will turn around during the hearing on March 15. He may have removed the article in question, but he’s not backing down. His latest: “‘Damaged’ Alligator Threatens Legal Action.” According to the article, it seems that HAN might have another lawsuit on its hands. 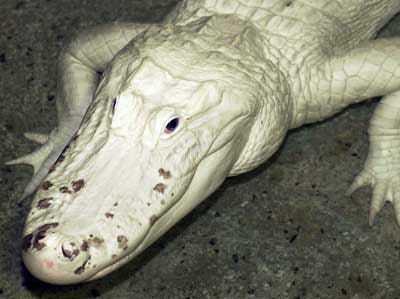 This time an alligator that the site outed last October for intentions to escape is suffering from a diminished reputation. Local kids won’t even go near Old Blue Eyes the alligator. As dedicated legal news watchers, we hope it does.